Recently, Casey and I have been attempting to set life goals – both as a couple and individually. I’ve found it to be a difficult exercise, but one that is very much worth doing. The process forces me to actually slow down and think about what is most important to me and what I want to accomplish in my lifetime. That’s definitely a Good Thing. One January 1st, The Robot Co-op released the final version of 43 Things, and it’s pretty sweet. The drop dead simplicity of the prerelease site is somewhat missing, but it’s still very intuitive and easy to use. The new version emphasizes the social aspect, making it easy to view goals of specific individuals, create teams (not really sure what the point of this is yet), read comments from others who have already completed goals on your list, and create posts to your blog about your goals. This is all very cool stuff, and it will be fun to see how it evolves as more people find it and as the Robots add more features. 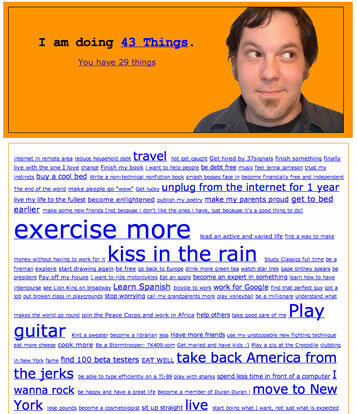 I’ve got my 43 things. Do you?